Should the third step read: "Determine the correct spelling and usage"
"Spelling is definitely taught differently in schools now," said Fran Clay, coordinator of Elementary Language Arts for the county school system. "We're trying to get far beyond just memorizing a list of words. 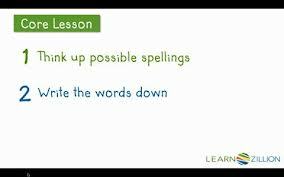 The focus now is on word study, on vocabulary, phonics, as well as spelling. We want students to understand how and why words work." The new spelling regimen, part of the Common Core standards for language arts being instituted in Maryland public schools, is based on the "Words Their Way" curriculum developed by Donald Bear, a former teacher and researcher in literacy development. Under this approach, students use "word sorts" to compare, contrast and analyze words, to recognize patterns, and to learn spelling principles. Teachers have been discovering ‘new’ methods for teaching spelling for several centuries, and they all appear to produce better results for a year or two. But because at least 3,700 common English words contain some unpredictably used letters as in 'a blue shoe flew through to you too' (all of which are shown at http://englishspellingproblems.blogspot.com/2010/11/english-spelling-rules.html ), even gifted spellers take at least 10 years to learn them all, and nearly half of all students never manage to do so. Nothing but modernisation of English spelling habits will ever make much of difference to that. Does the official writing the notice of the Common Core meeting in Florida know that "insure" and "ensure" is one of several hundred heterographs in the English language? Maybe "heterograph" would be a good spelling word for this writer to study and memorize for the correct usage/spelling of "insure" and "ensure". We should expect educators educating other educators use correct grammar and spelling. These educators are charged with teaching children correct grammatical structure and usage/spelling of words. The teacher in the tweet is correct: Grammar is important!